An Epic First Weekend of the 50th San Francisco Cherry Blossom Festival! The first weekend of the 50th anniversary Northern California Cherry Blossom Festival was filled with memories and epic moments! Despite a rainy start on the morning on the first day, the festival powered through and by 10AM, the rain had stopped, the sky cleared up and the sun came out. And the rest of the weekend was greeted by the sunny beautiful weather perfect for a festival. We’ve shared pictures taken by professional photographers on the festival’s Facebook Page, where you can follow us too. Please enjoy them and tag #nccbf50 with your pictures taken at the festival too! We’d love to see them. Special thanks to the festival’s performers both locally and those traveled from Japan to perform for you, the festival visitors. Every audience feels their hard work, creativity, and dedication through their arts. Heartfelt thanks to all the artists who showcase and taught festival visitors their art in Ikebana, tea ceremony, Shishu (Japanese embroidery), origami, Washi Ningyo (paper dolls) and more. Cultural art classes like these are valuable and what makes this festival meaningful. 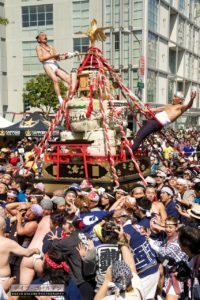 The festival continues this weekend at Japantown with new programs, activities, and performances. Check out the schedule for the 2nd weekend here. Please come back and join us for more fun, new programs and performances line up, eat more tasty food and enjoy to your heart’s content. 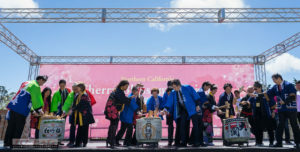 On Sunday (April 16), don’t miss the grand finale of the 50th Anniversary Cherry Blossom Festival Grand Parade starting at 1PM at San Francisco’s Civic Center and ending at Japantown’s Peace Plaza on Post Street. The Grand Parade Grand Marshal this year will be a 3 times sumo wrestling champion, Konishiki Yasokichi! So don’t miss out! We will see you at the festival!